If you are in Siena over the next few months, take advantage of the special opening to the public of the Palazzo Chigi Saracini, a beautiful medieval palace in the center of Siena normally closed to the public as it houses the Chigiana Musical Academy. In an attempt to share its extraordinary art collection and offer a glimpse of the internal medieval architecture of the palace, the Academy has set aside a few days a week to open the palace to visitors during certain periods of the year. This year up until October 30th (but again from December 26 to January 6, 2011 if you are here during the holiday season), the Gothic palace built in the 12th century and a part of its impressive art collection can be visited with the benefit of the useful explanations only a tour guide can offer. While the palace was built by the Marescotti family, it was Galgano Saracini that started his private art collection between the 17th and 18th centuries. He collected art paintings, statues, bas reliefs, ceramics, precious items made of ivory, wood and semiprecious stones. The collection is quite eclectic but all periods are represented, from the Renaissance up to the 18th century and include works by Botticelli, Sodoma, Beccafumi and Sassetta. Guided visits will last an hour and are offered on Fridays and Saturdays at 11am, 12pm, 3pm and 4pm. The visit costs 7 euro but students, groups and seniors over 65 will receive a discount. To book your visit, you can email siena.palazzochigisaracini@operalaboratori.com or call +39 0577 286300 Monday through Friday from 9am to 5pm and Saturday and Sunday from 10am to 5pm. Or you can pass by the Chigiana Music Shop located on the ground floor of the palace and see if last minute spaces are still available. 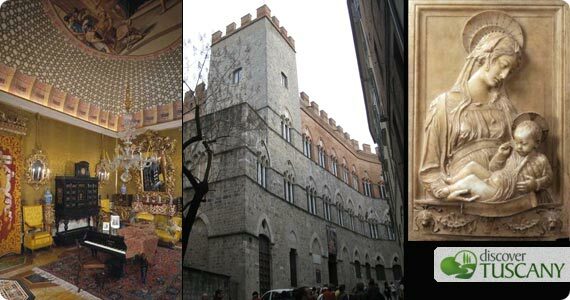 The palace will be open for visits on May 1, in case you’re in Siena this coming up weekend. We hope you enjoy this treasure in Siena! The calendar for a sleepless night in Florence!